Promotional value expires 90 days after purchase. Amount paid never expires. Non-3D films only; extra $3 charge for 3D films. All tickets must be used at the same time. Not valid on Friday or Saturday or first week of the movie. Limit 1 per person, may buy 3 additional as gift(s). Valid only for option purchased. Merchant is solely responsible to purchasers for the care and quality of the advertised goods and services. Named one of WestJet Magazine’s Five Iconic Movie Theatres, The Dunbar Theatre keeps things simple: top first-run films, fresh popcorn, comfortable seats, a friendly staff, and one big screen. But in simplicity is something fresh. Those newly installed seats have enough room that audiences can stretch their legs, armrests raise for cuddling, and a balcony lets viewers change up their sightlines. Old-fashioned styles aside, the movie house stays up-to-date with recently upgraded projection technology and a sound system with the clarity of 10,000 Morgan Freemans. Located near UBC, the theatre is within walking distance of numerous diners and cafes, making it a date-night no-brainer. 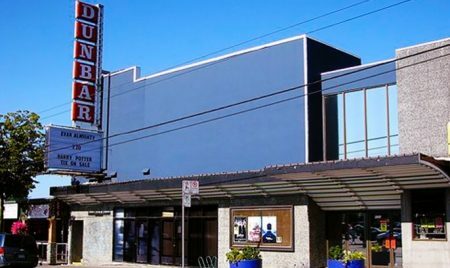 As one of the few remaining independently owned movie theaters in Vancouver, The Dunbar Theatre also offers specials, including free movie giveaways, to fans of their Facebook page.